Why is Councillor Wong-Tam calling for a review of the protected bike lanes? 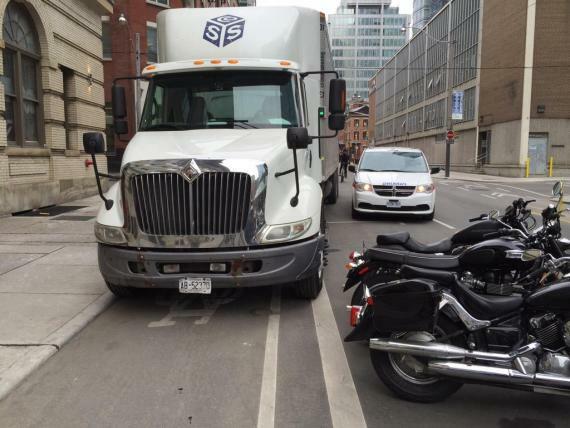 Read more about Why is Councillor Wong-Tam calling for a review of the protected bike lanes? What separated bike lane should look like. Try parking a truck here! Beauty should drive planning. I'm digging into improvements for the new protected bike lanes on Richmond, Adelaide and Simcoe. These lanes, known as cycle tracks by the planners, are currently a pilot project and are part of an environmental assessment that still needs to be approved by City Council. Previously I looked at better protecting cyclists at intersections. I'm quite happy—like many cyclists—that we've got new protected bike lanes on Richmond, Adelaide and Simcoe. These lanes, known as cycle tracks by the planners, are currently a pilot project and are part of an environmental assessment that still needs to be approved by City Council. The first cycle track in Toronto is now complete! After all the politics and foot-dragging, Toronto is now in the club with the likes of New York City, Chicago, Montreal and Vancouver.